It seems like Thanksgiving just passed but now Christmas is just around the corner. That means it’s not too early to start thinking about everyone’s favorite part of the holidays – the meals. For most of us, holiday meals mean delicious staples such as ham, mashed potatoes, stuffing, and plenty of pie. A great way to make these trusted holiday standby’s shine is by pairing them with the perfect wine. Many of us like to start off the holiday celebration with some simple appetizers, giving everyone a chance to reconnect with family and share a story or two. A great complement to even the simplest spread of cheeses is a Chardonnay. Chardonnay’s acidic notes are especially suited for more creamy cheeses like brie and Gouda. But feel free to explore, as Chardonnay’s apple, butter, and oak flavors work great with a number of delightful cheeses. After everyone has settled in and enjoyed appetizers, it’ll be time for the main course. A typical holiday meal of ham, mashed potatoes, stuffing, rolls, and green beans offer a number of wine pairing choices for all family members. 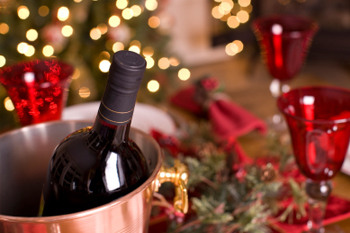 For those that prefer red wine, pinot noir is the ideal choice for this festive occasion. The lighter flavors and medium body of pinot noir is an apt companion to the holiday ham. When choosing a white wine to pair with dinner, a logical and classy choice is pinot grigio. Pinot grigio is a light white that neither overpowers nor is dominated by the ham or the spread of fresh holiday vegetables. An added benefit of pinot noir and pinot grigio is their widespread popularity which means they’re likely to please all generations and tastes at the table. The grand finale of any holiday meal is always the array of pies, cookies, and treats that make up dessert. Dessert wines can be a little tricky to choose but a great selection to pair with the traditional apple and pumpkin pie is a sparkling dessert wine which offers citrus and berry notes that fit seamlessly with those classics. If you’re serving more decadent desserts with chocolate or a pecan pie, consider a port to match the richness of your final course. By this time, everyone is certainly well fed and it’s just about time for bed. Pairing your holiday meal with the right wines is a great way to add another dimension to the holiday meal everyone’s looking forward to. Happy Holidays! Warren Howe is a wine enthusiast and writer for Vintage Cellars. Vintage Cellars has designed and constructed custom Wine Cellars for over two decades. Vintage Cellars also specializes in a number of wine storage options including wine cabinets and Wine Racks .